Will the Chargers run away to Los Angeles? Is there a chance that they just might stay in San Diego? It doesn’t really matter what the Chargers, their fans or even San Diego thinks right now because the decision has been thrown into the NFL’s court (Click Here for updated NFL betting odds). The San Diego/Chargers contention has been a long running complication for the NFL. All parties involved in the situation spent 2016 trying to find a way to keep the Chargers in the San Diego. 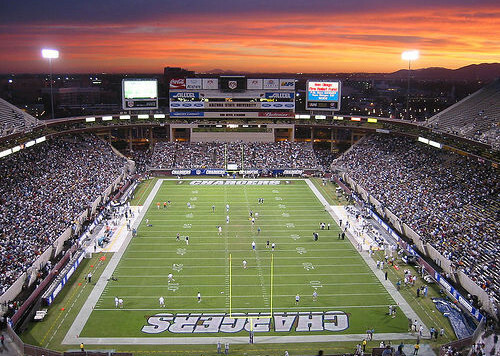 Local officials resisted pressure from fans to simply give into what many considered to be lavish demands from the Chargers; instead, they used the final days of the previous year to present what they considered to be their best deal, an offer for public contribution toward the construction of a new stadium that could possibly satiate all the parties involved. However, it looks like local officials might have done too little, too late because it is no longer within their power to determine the future of the Chargers. Chargers Chairman Dean Spanos was never a fan of the concept of moving the team to Los Angeles. However, it looks like 2016 might have been the Chargers’ final season in San Diego. Spanos basically suggested that he had no other choice but to go to Los Angeles. However, Spanos was obviously anguished by that prospect. As such, he turned to the only other source of assistance left in the arena: the NFL. Spanos appealed to the organization for help to remain in San Diego, an outcome the NFL has expressed support for. And the NFL, to their credit, have taken to the task of keeping the team in San Diego with some fervor; League sources said last week that parties at the league level and ownership level were discussing the matter and looking for possible solutions to keep the Chargers in San Diego. There is a chance that help could come; the NFL just might rise up to the occasion and come through for the Chargers in their hour of need; however, if the NFL cannot provide assistance, then the Chargers will head to Los Angeles alongside the Rams. Last January, Spanos’ fellow owners rejected a bid by the Chargers and the Raiders to build a stadium in Carson; this was during the same period when they approved the Rams’ stadium project in Inglewood. They presented an option that Spanos must either accept or reject by January 15th. The Chargers and the City of San Diego spent 2016 haggling over a funding proposal that saw San Diego begin to seriously consider the possibility of moving to Los Angeles. The Chargers have taken a more favorable stance in response to the City’s most recent offer; however, the $375 million being offered is a hundred million dollars less than what the Chargers want. The NFL has already pledged large sums of money to stadium projects in San Diego; it is questionable whether they will show a willingness to pledge even more money. The Chargers are probably more trouble than they are worth, at least as far as many people in San Diego are concerned, but the city is determined to ensure that they stay put.